This expanded variety of cameras allows IT administrators to flexibly select the ideal camera for their application. The surveillance management application enables rapid search and retrieval of video, plus 'tagging' of important video clips. The NetBotz camera pod and CCTV cameras (through the CCTV adapter pod) are compatible with NetBotz 300, 400 and 500. Add third-party closed-circuit television (CCTV) cameras to select NetBotz Appliances. Integrates 3rd party analog cameras Allows compatible NetBotz Appliances to increase video capabilities by leveraging a wide range of analog camera technologies. 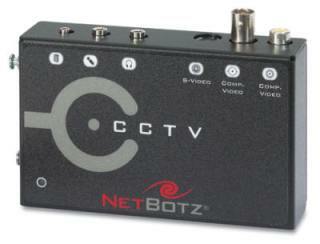 Full-motion video camera Capture a visual record when used with a compatible NetBotz appliance.